We are potters and poets, writers and energy healers, we are watercolorists, musicians, and one who has never ever picked up any type of art supply. We are a group of (10) creatives who have chosen to come together once a week and work towards encouraging and overcoming our creative blocks. Joining this group was a conscious decision of mine in getting established here in a new town with likeminded people. The group is run like this: We have a meal together, we watch a Ted Talk for the first 20 minutes and then we dive into our conversations about our creative struggles and processes. Last nights Ted Talk was Brene Brown’s The Power of Vulnerability. And if you are like me, you have probably seen this one more than once. I think I have watched it more than a 5-6 times in the past 7 years. I always get something more out of it. This time wasn’t any different. I even felt the tears start burning my eyes before the video even started because of “THAT” word. Webster’s definition: the quality or state of being exposed to the possibility of being attacked or harmed, either physically or emotionally. My definition: Putting yourself out there in order to grow, to live wholeheartedly and authentically. To risk being misunderstood. All the emotions I have been feeling rose like oil separating from a good deep flavorful broth. 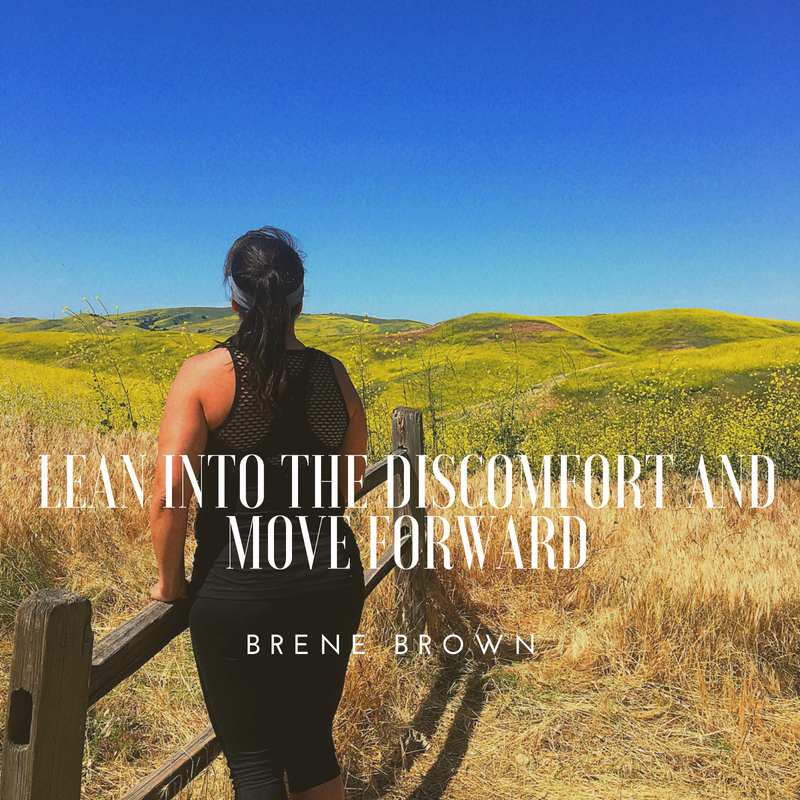 “Lean into the discomfort and move forward” , Brene said. I wrote it down hard and fast in my journal. “YES” I thought…..I know how to do this. I know how to lean in and feel. I know how to strip away the bad stuff from the good stuff. 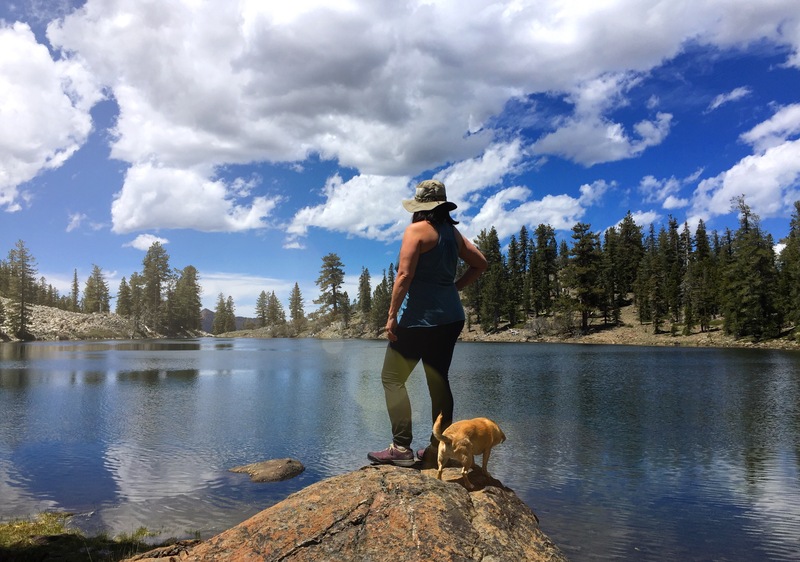 I started to feel a sense of relief….and not so heavy with the struggle of “rehinging” myself. This was another branch of my #justshowup process. I was present, with a likeminded supportive group, learning, relearning, …giving myself this weekly two hour gift. But then the facilitator suggested we all be vulnerable and share the real reason we are sitting in the circle. Eyes grew large, some looked down, a few crossed their arms….. Were we actually going to GO there……10 strangers baring their hearts and souls. At our first meeting, we committed to show up for each other for the next 10 – 12 weeks. THIS, was our first real be here for each other moment. THIS, was our first personal #justshowup moment with this body of artists. Who was going to go first? Not me, that was for sure and I didn’t even know how vulnerable I wanted to be. Were we going to hold space for ourselves and each other? God, this was going to be damn messy. Three weeks ago, we barely knew each other. Last night we walked out holding a piece of each others hearts. As was every person who sat around that circle. Because this is part of my showing up process for myself. This was an experience that I knew I had to write about before I lost the deep emotion that came because of it. 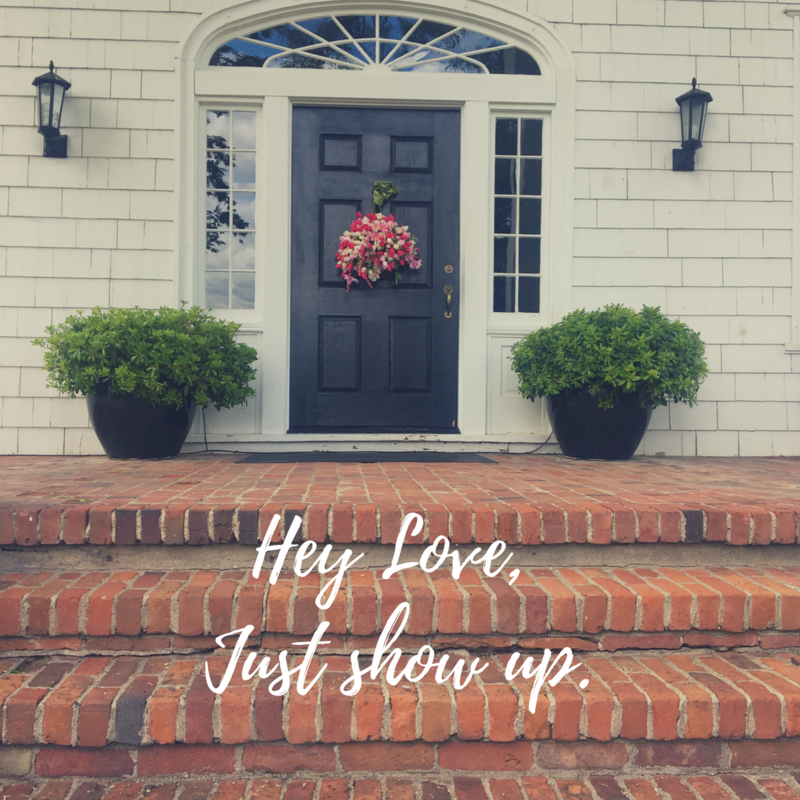 Sometimes showing up for yourself will take a little detour…it can’t always come in a perfect little package. What’s the struggle then, if that were the case? We wouldn’t need to dig deep. Nudge the door open a bit more to allow space to show up for yourself. Maybe that means being vulnerable. NOTE: I will be back next week with the 4 foundational values…promise. But for now, Mike and I are planning a weekend getaway to the coast with our dogs. I am hoping for inspiration to catch me there. Catch my other two #justshowup posts here and here. Lesley, You have captured it well. Thanks for sharing some of your tender parts.